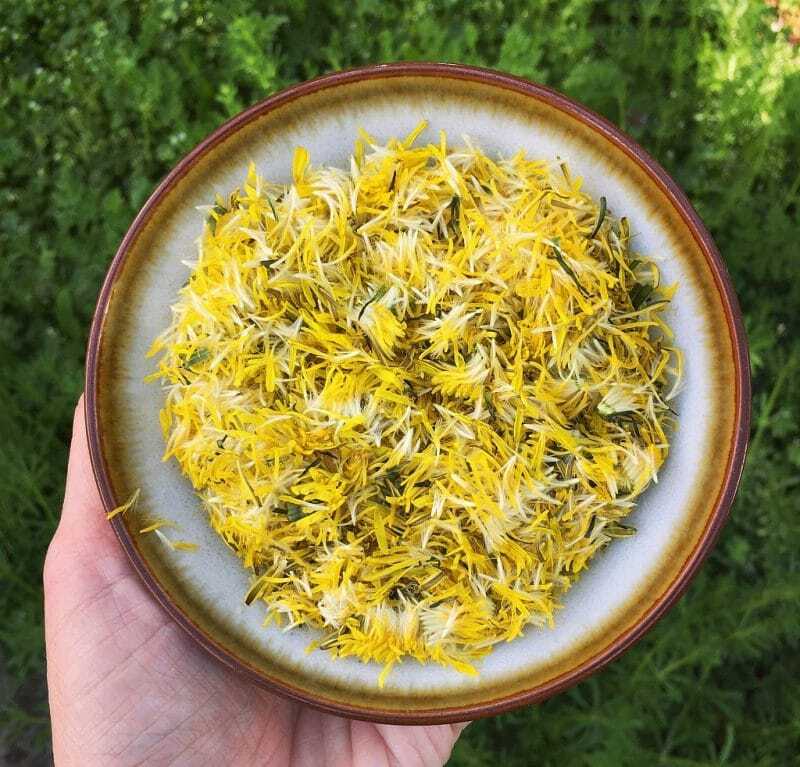 Dandelion wine is an old school recipe that has been around for centuries. The yellow petals have a honey-like flavor and they make a delicious wine! 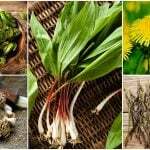 I prefer to make dandelion mead, as I feel like it is even more flavorful that way. Mead is simply wine that is made with honey instead of sugar. 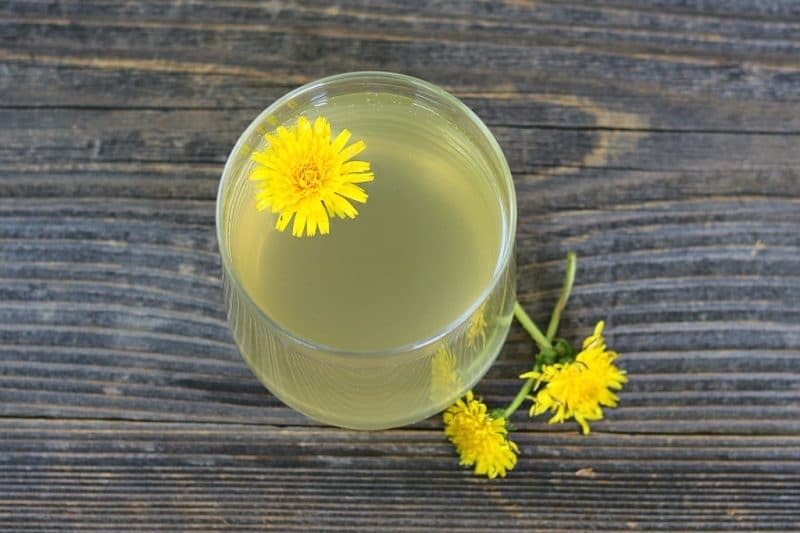 This dandelion mead recipe is easy to make and uses the abundance of foraged dandelions to make a delicious and highly drinkable beverage! 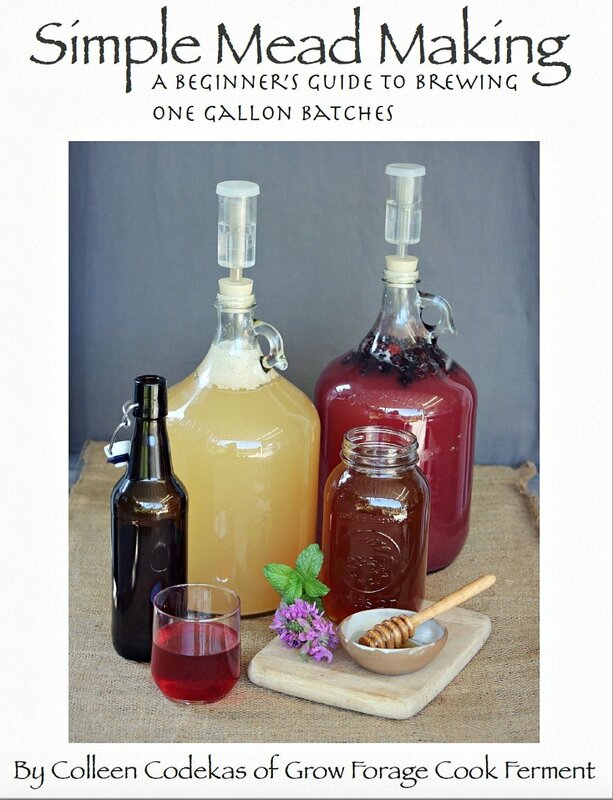 If you want to learn more about making mead, I have a Simple Mead Making for Beginners eBook just for you! It has ingredient and equipment checklists and detailed instructions for brewing and bottling your mead, so be sure to check that out if you’re new to the mead making process. 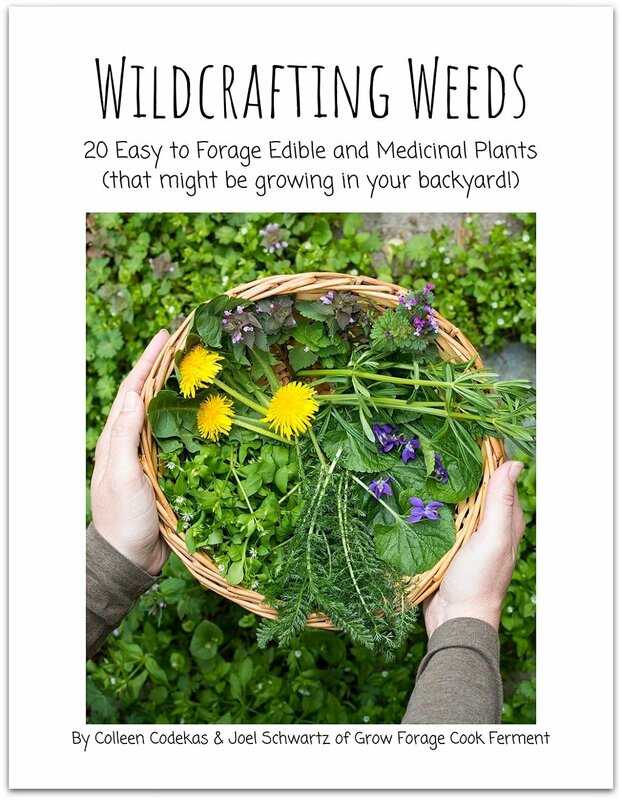 The first thing you will need to do is go out and forage for some dandelions. 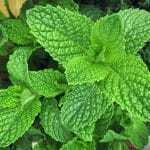 This usually isn’t too difficult, as they are quite prolific in most areas! Just be sure that they haven’t been sprayed with any toxic chemicals, because unfortunately many people still consider dandelions as weeds. 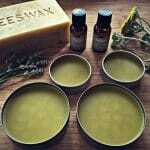 You’ll need about one cup total of the yellow petals only, with as little of the green part as possible. It’s ok to have a bit of green, but too much will make the mead or wine bitter. 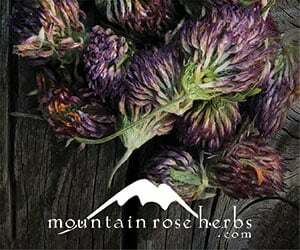 This takes a bit of doing as you will need to pluck all of the petals from the flower head. Don’t worry, it’s worth it! 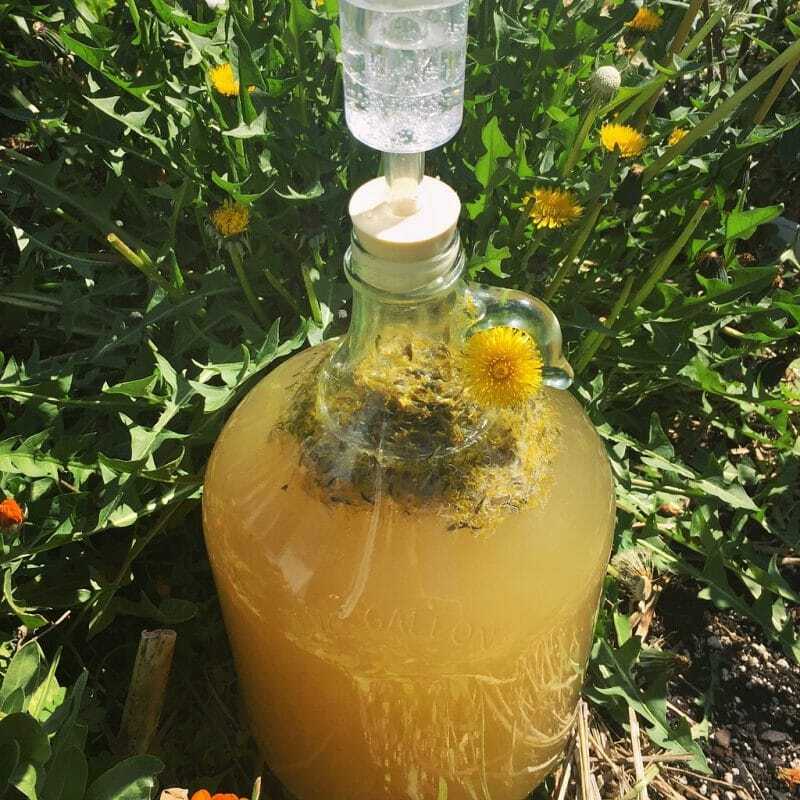 This dandelion mead recipe is a variation on my simple one gallon mead recipe. For more detailed directions and photos of the process, head on over to that post. You can find all of the equipment and ingredients you need for mead making here. 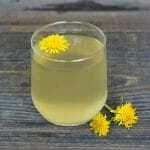 This dandelion mead is technically called a metheglin, which is any mead that has herbs, spices, or flowers added. 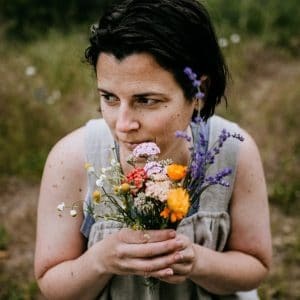 Some of my other metheglin recipes on this blog are wildflower mead and elderflower sparkling mead. Yummy! I prefer to leave the dandelion petals in the fermenting jug while it’s brewing so that it will continue to infuse as it ferments. 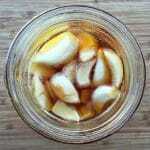 If you’d rather not leave the petals in, you can strain them out after the initial steeping, before adding the honey. Leaving the petals in can make bottling a bit tricky though, as they will want to go up the auto siphon. 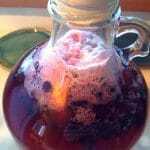 If you put a small piece of cheesecloth attached with a rubber band over the end of the siphon that goes into the jug, it will keep the petals out. This dandelion mead turned out so delicious, even after just a short amount of aging! 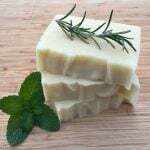 It will continue to clear up and develop more flavor over time. One thing that I love about my simple mead recipes is that they are usually quite drinkable after a short amount of aging (but longer aging never hurts)! 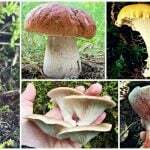 Or check out my 15 Easy Mead Recipes for Beginners all in one place! 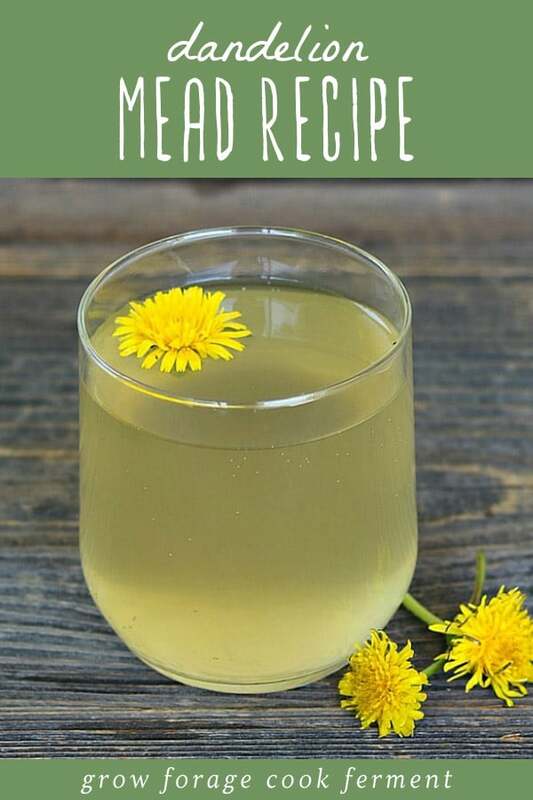 If you want to make dandelion wine, take it one step further and make this delicious dandelion mead! You’ll be so happy that you did. This is a delicious mead made with foraged dandelion petals. Sanitize everything that will be used in the brewing process. Put 1/2 gallon of non-chlorinated water and the dandelion petals in a pot and bring to a boil. Turn off the heat and let steep for 15-20 minutes. Add the honey and stir to dissolve, then add the juice of the lemon and carefully pour the honey water mixture into the jug using a funnel. Top off the jug with cold non-chlorinated water, leaving at least 2 inches of head space on top. Put the lid on the jug and gently mix everything around a bit. Make sure that the temperature of the must is below 90°F, then add 1/2 packet of champagne yeast. Put the lid back on tightly and this time shake the jug for a minute or two to distribute the yeast. Put a little water in the airlock to the line, then put the rubber stopper end into the jug. Put the jug in a dark place. It should start bubbling within 12-24 hours. After about 6 weeks of fermenting, or once the bubbling has completely stopped, the mead can be bottled and aged. When bottling, it is helpful to put a piece of cheesecloth over the end of the auto siphon that goes in the jug to keep the dandelion petals out. 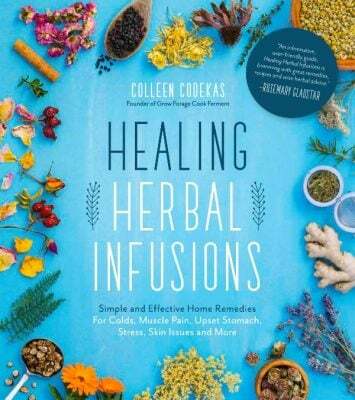 If you put a small piece of cheesecloth attached with a rubber band over the end of the siphon that goes into the jug, it will keep the petals out. How long should you age after bottling? Also will any wine yeast work? Can’t wait for all those beautiful little dandelions to start poking their heads out! Gotta try this recipe, thanks for it! What is the minimum aging time you recommend, and would this recipe benefit from racking to a secondary to clarify before bottling? What amount of alcohol is created in the mead? It depends on a few factors, such as the type of yeast and amount of honey used. It’s usually similar to a strong wine, around 15% or possibly even a bit more. I am Allergic to Honey. Is there another substitute I really want to try this recipe. 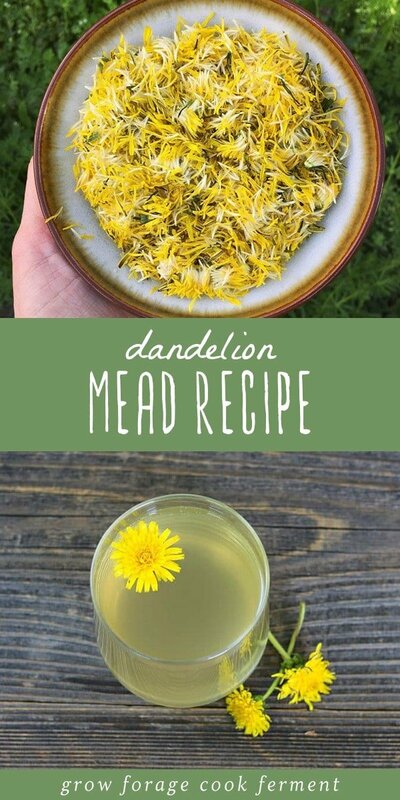 Mead is made from honey, so you would probably want to try a regular dandelion wine recipe! We used agave, and it didn’t ferment as it should. It’s been sitting in the jug, and we haven’t tasted it yet. 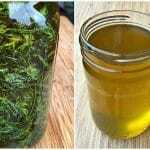 Technically you can use any sugar alternative like agave nectar, sugar, maple syrup, or dandelion syrup. 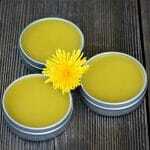 Though honey is the best because it comes with its own yeast that helps with the fermentation. If you choose the other sugars/substitutes you might want to keep the mixture open a bit longer for getting some wild yeast as well. Might want to play around with other starters as well instead of just wine yeast. I have been very fortunate with ananas, banana, and ginger starters, where fermentation can start with minutes. 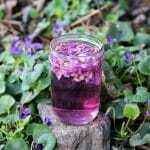 Is it possible to do this with dried petals or would that have a negative effect on the mead? 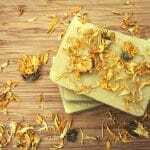 If you have dried dandelion petals that would work! I find it’s hard to dry them though as they will often just turn to puffballs during the drying process.